I am the first to admit that Sherman enjoys a plush lifestyle. After all, the pooch sleeps inside, eats premium food, has full medical/dental benefits (supplied by me) and has a selection of delightful things to gnaw at any given time. 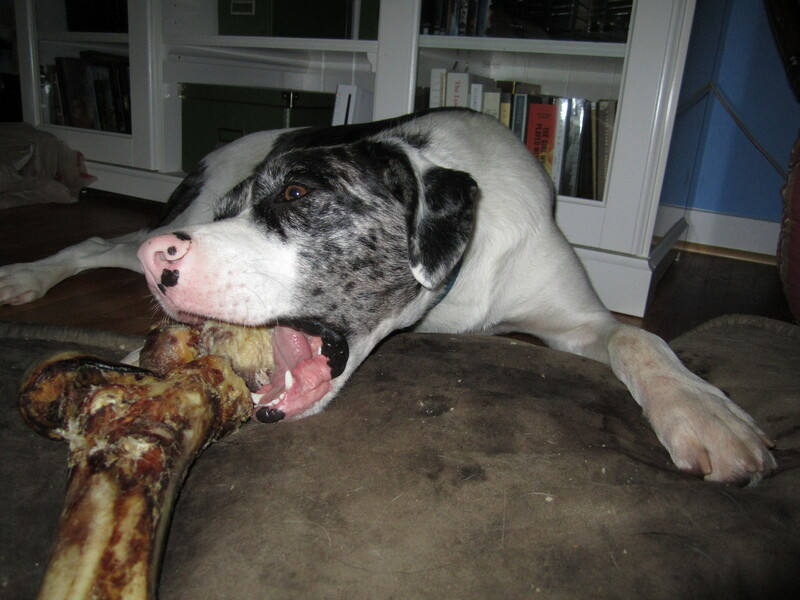 The big mouth with beef bones. Sherman also owns more toys than the average preschooler, and he’s just a year old. I take him to daycare every Tuesday to play with his buddies; he comes home so tired he would rather go to bed than eat his dinner, which is a good thing. 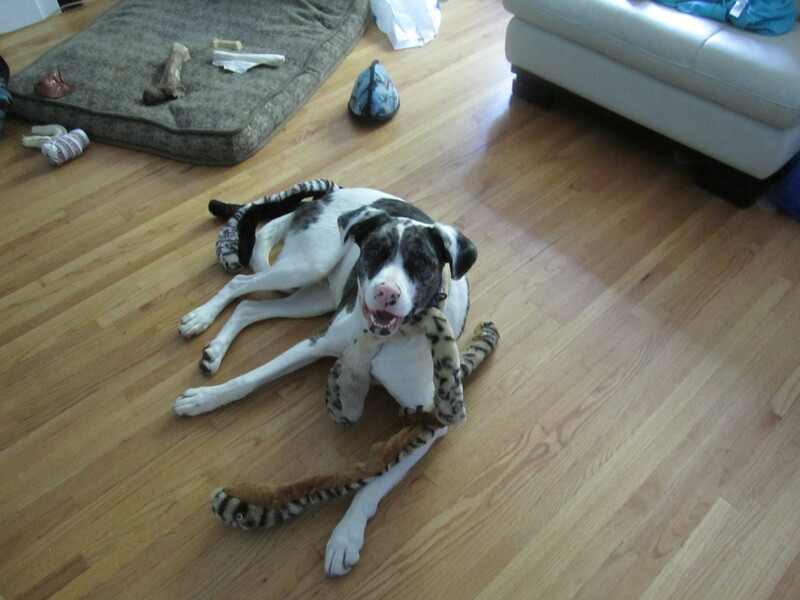 Sherman also owns more toys than the average preschooler, and he’s just a year old. The spotted one has it all, really. An embarrassment of canine riches, indeed. Whatever the evidence might suggest, though, I don’t consider Sherman spoiled. Let’s recap, shall we? He’s half border collie, widely considered the most intelligent breed of dog. The other half is boxer, often regarded as the most ridiculous dog as a pup; have you been to a place with young boxers? They are eighty miles an hour, all the time they are awake. Basically, I have an extremely high-energy dog with the brains to get himself into a great deal of trouble in record time. Believe me when I say that Sherman needs to be entertained, and he needs to be exercised. Both our sanities depend upon it. That’s why I bought him a treadmill last week. Yes, the kind that plugs into the wall and allows one (or her dog) to walk inside. Don’t get me wrong: I am not a super-permissive person with a spoiled, out-of-control dog. Sherman follows rules. He is not allowed on the furniture. He waits to eat his treats and his dinner for my release. From the day he arrived here, I’ve worked very hard with him to create a balanced, obedient companion, and it shows. The treadmill ensures that Sherm will continue to get his exercise through the winter. I know that within a few months we will be well below minus twenty. When the weather takes that nasty, nasty turn, from which it won’t return until spring, I won’t be able to walk Sherman long enough to tire him out without risking freezing his feet and face, which is not acceptable. He also has a short coat and doesn’t tolerate the cold very well. Despite my own insulating layer, which is slowly decreasing in the pool, I don’t handle super chilly weather well either. The treadmill will allow me to walk Sherman for an appropriate amount of time even when the winter has my city by the nostrils, and everyone in the dollhouse will be happy. Did I mention I only paid fifty bucks for it? A sweet older couple was moving out of their house for the snowbird life, and needed to unload it fast. Thank you, Kijiji. Welcome to the dollhouse: sample the treats in our very nearly gourmet kitchen, settle in with the many fine reading selections on our blog, and enjoy our all-new doggy day spa. It’s a beautiful life. So, I’m trying to picture this. Will you both be walking on the treadmill together? If just one of you, which one? Can you videotape this please? Yep, treadmills are excellent for spirited dogs. Sherm walks willingly on one at day care, so he’s adjusted very well to the one in our basement. We’ve had dogs that walk on the treadmill before. They LOVED it… hope it’s a success! So far, so good. He’s still a little weird about going down the stairs to the basement, but we’re getting there. Once we’re powered up and he’s trotting along he loves it. There’s got to be a hundred thousand orphans who want to be reincarnated as Sherman! It’s true; he lives a life better than many people. I’m not really down on the scale yet, but my assets seem to be relocating slightly to the north, and stuff is definitely firming up! I hope your efforts are also paying off. I’ve been sending you positive thoughts!